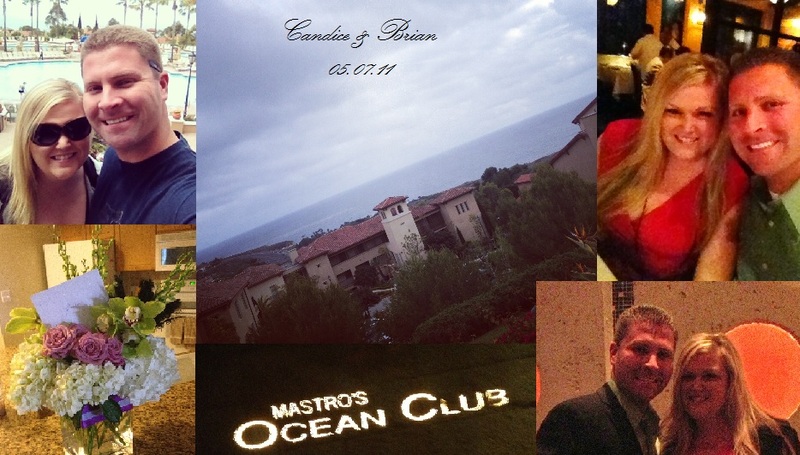 Two years ago today I said “I Do” to Brian. I swear it seems like yesterday, and here we are, another year down! I just wanted to take a personal moment…..and talk about my husband and the amazing 2nd year that we shared as husband and wife! Of course we spent the past few days celebrating year #2! We spent the night down at the Newport Coast Villas, had an amazing dinner at Mastro’s, and then spent the whole day together today alone. A walk down on the beach at Crystal Cove, lunch at the Beachcomber, and a beautiful arrangement of flowers for me…. it was simply perfect. God I love this man. We had a few really hard moments this year, well in the past 6 months actually….. and as cliché as it sounds, it all only brought us closer together. At some of those hard moments my eyes were opened to just how strong we are together and I seem to fall in love with him all over again. We of course had some great moments as well, celebrating each milestone together. Its been another great year, and I feel so lucky to have this marriage. I so treasure all the happiness it brings to my life daily. The day we got married, I didn’t think I could love Brian more. I was so wrong! Each year that goes by, I grow to love him more, and I know that will only continue over the years. I respect him, trust him, and value him in my life. He daily teaches me something new, and challenges me to be more. I could go on and on about this man, sometimes I wonder how I got so lucky! I know he feels the same way, and he shows me that love in everything that he does. This is the good stuff friends, this is what love is all about. A friend, a partner, and teammate. Brian, thank you for another great year, and for a great anniversary! Here’s to us, our marriage, and the years to come! And because I always want to remember what an amazing wedding day we had…. here’s our highlight video! Brings tears to my eyes every single time! Next Post kim + steve wedding trailer!